In 2001, while still working as Chef Sommelier and wine buyer for restaurant in London, I went with my best friend trekking down the trails of the Massif Torres del Paine, in Chile. We spent a few days in Santiago and its surroundings, like Valparaiso, Maipo, Rancagua, Coricó, Casablanca and Viña del Mar (among others), to visit the regions and the scattered wineries. For a person like me that very much enjoys spending a great deal of time outdoors, what I liked the most was the fact that Chile is so narrow and present so much extreme in temperatures and landscapes, that it is surely one of the only countries in the world where you could spend your morning skiing and spend the rest of your afternoon sunbathing on the beach with the least amount of time wasted by crossing the country from east to west (4 hours at the most from the custom village of Portillo at the boundary with Argentina in the Andes to Valparaiso, the white fishermen city that seems to slide in the Pacific ocean). At the time, only some the most well-known winery were exported to the UK, and one of my favorite was Viña Cousiño Macul for their renown Bordeaux like Cabernet Sauvignon based wines. Shortly after, I moved to the US, and while the UK continued to discover and import more Chilean wine brands and labels, the US market seemed that it had been flooded with Concha Y Toro and pretty much nothing else from Chile. Even the confirmation of Carmenère, as one of the leading grape variety massively produced in Chile to respond to the rapid and massive increase of the Argentinean Malbec popularity and the up-and-coming Uruguayan Tannat, didn’t expand the image of Chile in the US market. Cabernet Sauvignon from Maipo and Chardonnay from Casablanca seem to be the ever-trusted grapes and wine style from Chile. Yet, Chile abounds of different types of soils and microclimates that are ideal for grape growing and the production of world-class quality wines. Therefore, is it by lack of interest so then that the American market is so poor in Chilean wines? (from the importers or from the consumers?) Well, it is difficult to say but the situation is deceiving for sure. However, although the NYC market seems to be light or weak on its offering of Chilean wines and presents barely no promotion of them, but they are some very interesting Chilean wines if you dare looking around in the multiple importers and distributors portfolios that New York has to offer. Amayna is definitely one of them. 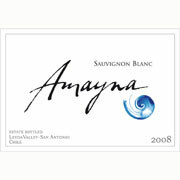 Amayna is produced by the Garcés Silva Winery located in San Antonio, a coastal city about 104 kilometers west from Santiago and about 14 kilometers from the Pacific ocean. The Garcés Silva family has long been involved in agriculture, livestock and wine-growing, as well as the beverage, financial, and real-estate industries. José Antonio Garcés Silva, a businessman who acquired the property in the Leyda Valley - San Antonio area, thus becoming one of the pioneers in the area’s “viti-vinicultural” development, founded the winery that bears the family name. San Antonio is in the Leyda district, and represents the entryway to explore the San Antonio Leyda Valley. Leyda is located in a valley that lies between the Coastal Mountain Range and the Pacific Ocean and runs parallel to Chile's Central Valley. Its gentle coastal hills are characterized by poor soils and very dry climate. The climate is characterized by its well-defined seasons and a low day-night temperatures differential due to the maritime influence. The vines grow on organically poor soils. Granitic soil: It can be found along hills and slopes and makes up 20% of the total surface. This soil is made up of red clay bearing high ferric oxide content. Vastly fractured granitic quartz rock appears at a depth of 50 cm. Alluvial soil: It is found along the hillsides. This soil is rich in clay, with a great deal of gravel and round stones. Despite the family long involvement in agriculture and viticulture, Amayna is a fairly young project producing wines only from the property vineyards. The area planted in production now encompasses about 39 hectares of vines that were firstly planted in 1999. The vineyard regroups about 4.5 hectares of Chardonnay, 8.3 hectares of Pinot Noir, 12.3 hectares of Syrah, 2 hectares of Gewurztraminer and about 12 hectares of Sauvignon Blanc, which they are renown for. This wine was made from handpicked selection of Sauvignon Blanc grapes from vineyards about 8.6 miles from the Ocean. It was left for 10 days in stainless steel tanks for fermentation then spent an additional 2 months on its lees to allow better texture and complexity. The fresh gentle ocean breezes combined with the poor soils characteristics allow for tremendous aromatic potential and great intensity in the wine's floral aromas and fresh, exotic fruit. The palate is fresh, crisp with great acidity and somewhat hints of saltiness (here again read my previous post on salty wines). The finish is quite long and dry and not with a certain elegance. The time on the lees definitely conferred this balanced wine with personality and creaminess with a biting attitude. Perfect with the shellfishes, oysters and fishes that are the pride of Chile, freshly fished from the Ocean or the numerous rivers from the Andes. I tried this wine. Very intriguing floral and mineral nose with hints of different fruits. Complex long and persistent palette. Very elegant and kind of mysterious. A beauty. The best Sauvignon Blanc from Chile I had. Their Chardonnay is a beauty too.